The House Budget Committee chairman cites a study that says high debt stalls growth—but the economists responsible for the paper admit they made a "significant mistake." Paul Ryan’s numbers are wrong. As in: his most urgent argument on behalf of painful cuts to federal programs and the denial of new funding for job creation, education, healthcare and infrastructure repair is based on a coding error. The paper the House Budget Committee chairman has used as the intellectual and statistical underpinning for his austerity agenda has been significantly discredited by the revelation that essential data was excluded from the study, leading "to serious errors that inaccurately represent the relationship between public debt and growth." The Harvard professors who produced the paper—which Ryan cited as recently as last month—have acknowledged their mathematical error. And Ryan is definitely at the head of the list of the "guilty parties" that seized on the disputed research. After decades spent as a backroom conservative in Washington, first as a Capitol Hill aide and then as an obscure congressman from Wisconsin, Ryan raced to prominence after President Obama's 2008 election. Condemning Obama's spending to stimulate employment and growth following the Wall Street meltdown, Ryan positioned himself as an economic "Paul Revere," warning that public debt was stalling out the US economy. This notion was always questioned by savvy economists, such as Center for Economic and Policy Research co-director Dean Baker. But Ryan went all in, seizing on the controversial Harvard study as essential information for anyone concerned with debts, deficits, spending and budgets. Ryan began preaching an economic gospel based on his absolute certainty that when a country’s debt level tops 90 percent of its gross domestic product, it’s economy will decline and crisis will ensue. And he found plenty of takers for his dystopian analysis, which inspired obsessive talk about how the US economy was heading toward a apocalyptic "tipping point." As the House Budget Committee chairman, the Republican nominee for Vice President, and America’s primary proponent of austerity, Ryan rallied his party and much of official Washington around his argument that, because the United States had edged above the 90 percent level, immediate and draconian action needed to be taken to cut the debt. Echoing the messaging of billionaire-funded groups such as the “Fix the Debt” coalition, Ryan has argued that any “pain” suffered by working Americans—in the form of restructurings of Social Security, Medicare or Medicaid, post office closures and cuts to state and local aid—was necessary in order to avoid an economic meltdown. "Economists who have studied sovereign debt tell us that letting total debt rise above 90 per cent of GDP creates a drag on economic growth and intensifies the risk of a debt-fueled economic crisis," Ryan told a congressional hearing in 2011. When he accepted the Republican vice presidential nomination in Tampa, Ryan brought that sense of urgency into the national spotlight, declaring that "a defining responsibility of government is to steer our nation clear of a debt crisis while there is still time." Since the defeat of his national candidacy, Ryan has continued to claim that the threat of economic ruin is so clear that—despite their rejection at the polls—his proposals must be adopted by President Obama and Congress. 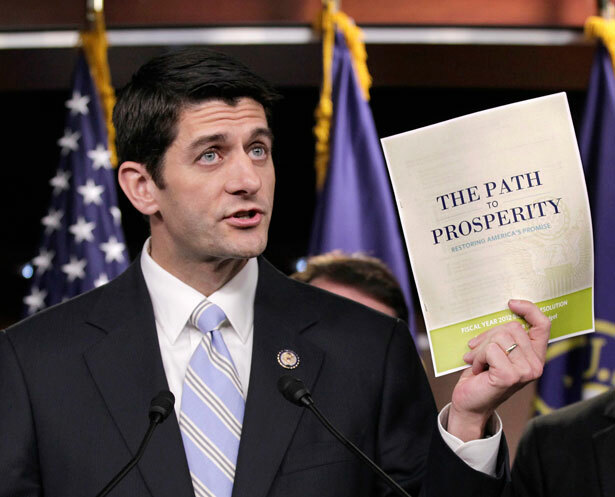 This has been and remains a steady message from Ryan, whose “Path to Prosperity” budget proposal rests on the premise that economists have "found conclusive empirical evidence that [debt] exceeding 90 percent of the economy has a significant negative effect on economic growth." But the 90 percent threshold is a false precipice based on a false premise. The paper on which Ryan builds his austerity argument was published in 2010 by Harvard economists Carmen Reinhart and Kenneth Rogoff. In the paper, "Growth in a Time of Debt," Reinhart and Rogoff concluded that “median growth rates for countries with public debt over 90 percent of GDP are roughly one percent lower than otherwise; average (mean) growth rates are several percent lower." In a new paper, "Does High Public Debt Consistently Stifle Economic Growth? A Critique of Reinhart and Rogoff," Thomas Herndon, Michael Ash, and Robert Pollin of the University of Massachusetts, Amherst successfully replicate the results. After trying to replicate the Reinhart-Rogoff results and failing, they reached out to Reinhart and Rogoff and they were willing to share their data spreadsheet. This allowed Herndon et al. to see how Reinhart and Rogoff's data was constructed. They find that three main issues stand out. First, Reinhart and Rogoff selectively exclude years of high debt and average growth. Second, they use a debatable method to weight the countries. Third, there also appears to be a coding error that excludes high-debt and average-growth countries. All three bias in favor of their result, and without them you don't get their controversial result. Herndon, Ash and Pollin (a frequent contributor to The Nation) reviewed and recalculated the information on which the Reinhart-Rogoff paper was based. They determined conclusively that data from key years and key countries had been erroneously excluded. When they included all the data from all the years and all the countries, the Amherst professors showed that the average growth rate of nations with a 90 per cent debt load does not decline by 0.1 percent, as suggested by Reinhart and Rogoff. Rather, the growth rate is a positive 2.2 per cent. "It is sobering that such an error slipped into one of our papers despite our best efforts to be consistently careful," noted the Harvard economist. "We will redouble our efforts to avoid such errors in the future." Give Reinhart credit for the admission. The Budget Committee chairman was never the economic whiz that his fans imagined. Rather, he’s an Ayn Rand-obsessed ideologue who seeks to promote austerity out of a seemingly sincere belief that it is necessary. If Ryan is honest, he must admit that his sense of urgency with regard to the debt is misplaced. He can still argue, as an Ayn Rand enthusiast and a Republican partisan, for cuts in federal spending and for a general downsizing of government. But he should at least acknowledge that the argument is based on Rand’s fictional writing, not on economic reality. Walmart's global labor practices are, workers say, wreaking death and destruction. Read Josh Eidelson's report.